Traditional Mexican clothing is distinct in its appearance and style. The patterns seen on blankets, ponchos and serapes show a strong preference for angular and linear designs. 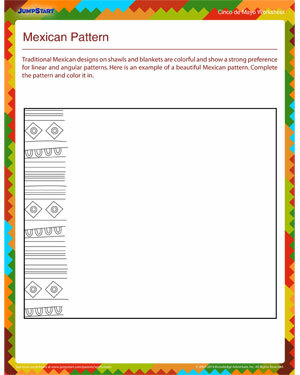 The pattern in this Cinco de Mayo worksheet is an example of the kind of designs commonly seen in Mexican clothing. Kindergarteners can practice their drawing skills by completing the pattern in this worksheet.